The 72-year-old master strategist ensured that the Congress's internal conflict ended and took on the Bharatiya Janata Party and Shivraj Singh Chouhan -- the state's longest ever serving chief minister. 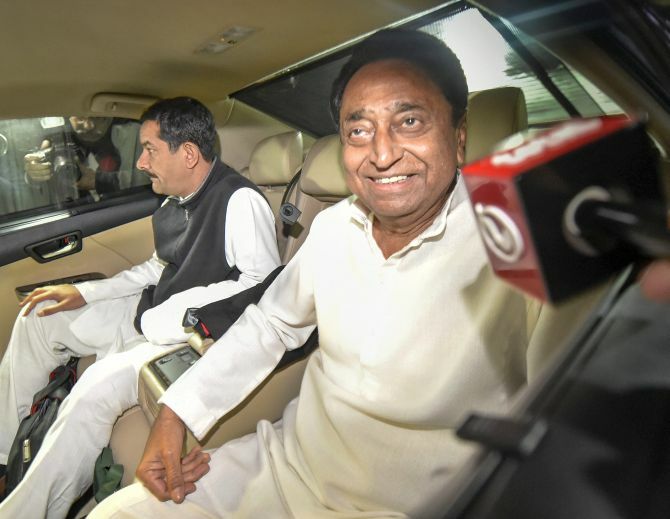 For Kamal Nath, the appointment as Madhya Pradesh chief minister on Thursday is a reward for his sharp political manoeuvring skills, which helped the Congress wrest power in a state where the Bharatiya Janata Party was ruling for three consecutive terms. The 72-year-old leader is known as a master strategist and Gandhi family loyalist, with a distinction of representing the Chhindwara Lok Sabha constituency in Madhya Pradesh for several terms. He led the party from the front in the just-concluded assembly elections and underlined the importance of unity for changing the fortunes of a divided Congress. “United we stand and divided we fall,” was the message he underlined while asking the rank and file to give their best collectively. Nath became the game changer as he recognised that timing was important. Others simply followed his lead, realising the necessity of putting their differences at the back burner. The Kanpur boy headed several ministries, but he gained fame for firmly putting up India’s stand on safeguarding farmers’ rights at the Earth Summit in 1992 at Rio de Janeiro and fiercely negotiating at the World Trade Organisation. He not only received accolades from the government but from the Opposition as well. His words at the WTO summit still echo at many conferences. He said, “Next time, can you bring a picture of an American farmer? I haven’t ever seen one. I have only seen US conglomerates masquerading as farmers”. The DoonSchool alumnus was close to Sanjay Gandhi and was a faithful of former Prime Ministers Indira Gandhi, Rajiv Gandhi and Narasimha Rao and now, close to party president Rahul Gandhi, a DoonSchool alumnus himself. He stood by Indira Gandhi in her fight against Morarji Desai in 1979 and now, four decades later, the loyalist steeled his grit and put all his political acumen to regain the state and oust Madhya Pradesh’s longest-serving chief minister Shivraj Singh Chouhan -- who served three consecutive terms. Getting back to the thick of things in the state wasn’t an easy task for him, especially, after the setback he received in Punjab before the assembly election. He had to return from Punjab as the 1984 riots controversy overshadowed his leadership. Madhya Pradesh too wasn’t an easy task. A video clip which went viral put him in the dock. The clip showed Nath telling Muslim clerics to ensure that 90 per cent votes from Muslim-dominated areas are cast in favour of Congress. Yet, he bounced back and ensured that internal conflict in the party ended and all factions worked towards the party’s victory. Notwithstanding the rivalry with Guna Lok Sabha MP, especially, after he was made the state party chief in the state, Nath brought Jyotiraditya Scindia under the wings along with former chief minister Digvijaya Singh and Suresh Pachouri. It was necessary to bring everyone together and fight the battle undivided. He went step by step. After having achieved his target within the party, he went after the rival BJP and took on “ghoshnaveer” Chouhan, knowing well enough that a fourth term will be a herculean task for the outgoing chief minister. The road ahead, however, may be bumpy for the chief minister as the 2019 Lok Sabha election is too close to convince the voters with promises at the national level. But the veteran nine-time MP knows how to win the hearts and minds of the people.